nerdia.net – Page 24 – The Nerd's Utopia – where we speak geek! When connecting an Asus EeePC 900/901 running Ubuntu eee 8.04 (‘Easy Peasy‘) to the Internet through a Windows Vista machine running Internet Connection Sharing (ICS) and you are experiencing intermittent DNS-problems, the problem can be related to IPv6 being enabled but there is no IPv6 Internet connection (only IPv4). In Firefox there is a DNS-error displayed, but hitting reload one or more times will bring up the desired web page. Internet access can also be experienced as slow or sluggish. The problem can be that IPv6 is enabled in both the Windows Vista and the Ubuntu machine but there is no IPv6 Internet connection. The problem can be resolved by disabling IPv6 in Windows Vista running ICS. You can of course solve it by disabling IPv6 in the Ubuntu machine but then you have to disable it in every client inte network using the ICS, so it is more efficient to disable it in the Windows Vista running the ICS. In Ubuntu eee 8.04 for Asus EeePC 900/901 (‘Easy Peasy‘) there is a problem when trying to look at Youtube videos. Almost all videos gives a message saying that it is not currently available. Try do uninstall ‘flashplugin-nonfreebeta’ using the Synaptics package manager. 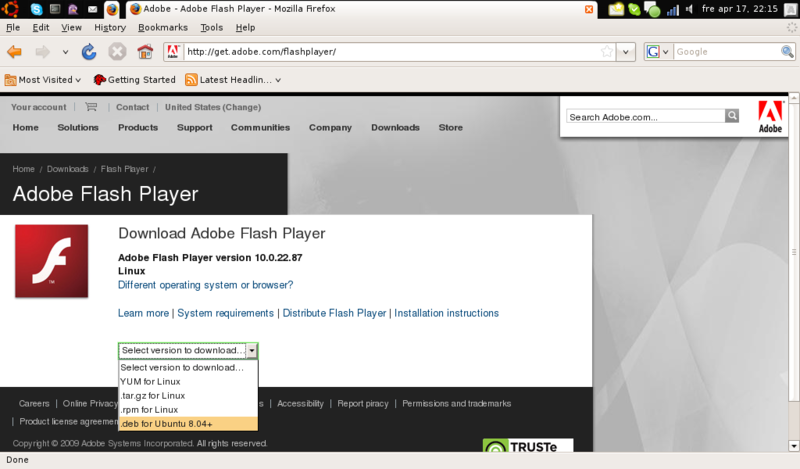 Go to http://get.adobe.com/flashplayer, download and install the latest flash player for Ubuntu 8.04. In WordPress blog software version 2.7.1 there is a problem after a default install when uploading images. The images are stored in the ‘wp-content’ folder but referred to with ‘wp-content/uploads’ path. The result is that uploaded images can’t be used in blog articles. To resolve this problem, click on Settings, then Miscellenous. Note that the media path is ‘wp-content’ but the note at the right says that default is ‘wp-content/uploads’. Just click the ‘Save Changes’ button and the problem will be resolved. There seems to be some default reference to ‘wp-content/uploads’ in the distribution of WordPress, but the settings are set to just ‘wp-content’. When using Ubuntu eee 8.04 (‘Easy Peasy‘) on an ASUS Eee PC 900/901 and you try to connect to a DLINK DI-624+ wireless broadband router with WEP security enabled, the network manager in Ubuntu eee keeps displaying a dialog asking for the WEP pass phrase, even though is entered correctly. The problem is the “Super G mode” in the DLINK DI-624+. Just disable it and the EeePC will be able to connect. To get your own style and feel of your osCommerce webshop there are different options at hand. One is to have someone to tailor your own design. This way your web shop will be truly unique, but of course at a cost that can be high. Other options are using free templates or buying a ready made one. Sometimes there is an option to buy a template “unique”. This means that the template will not be sold to any other customer after you have bought it. Normally you can also see how many that have bought the template before you. By using a free or commercial template you can get a starting point from where it can be modified to fit your needs. A lot of time and effort can be saved by using a ready made template and just modifying it. These are some sites were you can find templates or themes for your osCommerce webshop. On http://www.cromwell-intl.com/security/ you will find a number of articles related to Computer System and Network security. It covers chryptography, privacy tools, computer forensics, authentication, intrusion detection and network monitoring. GRC Shields Up! tests your firewall from the outside and reports what you are exposing to the Internet. At CERT, Computer Emergency Response Team, you will find up to date information about security related issues like newly discovered vulnerabilities. Stay updated! This page displays your current IP-adress, your reverese DNS name, how your browser identifies itself and if you are accessing the Internet through a proxy server. This is the information servers that you visit on the internet will see about you. https://nerdia.net/wp-content/uploads/nerdia-logo-340x156.png 0 0 Stefan Helander https://nerdia.net/wp-content/uploads/nerdia-logo-340x156.png Stefan Helander2009-03-15 11:40:342010-01-08 11:41:18What is my current IP-address? https://nerdia.net/wp-content/uploads/nerdia-logo-340x156.png 0 0 Stefan Helander https://nerdia.net/wp-content/uploads/nerdia-logo-340x156.png Stefan Helander2009-03-03 12:03:002012-08-30 10:34:23Changing "Welcome to the Frontpage" heading in Joomla! In order to analyze and troubleshoot networking issues over the Internet, there are a number of traceroute and looking glass servers availble. By using these, you can analyse the routing paths to your network. You are able to see how your network is beeing reached from different parts of the Internet. A collection of traceroute and looking glass servers is found on http://www.traceroute.org/. On Geektools you will find a collection of useful tools like traceroute and a whois lookup (who owns a certain IP-address). SamSpade.org has a whois gateway for looking up who owns a certain IP-address.